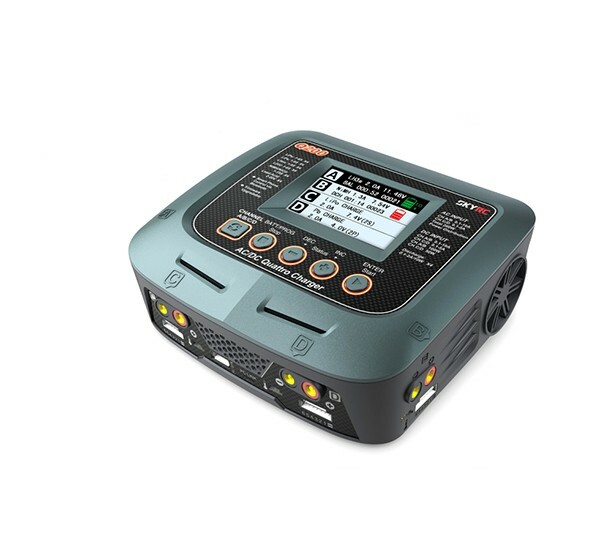 SkyRC Q200 is a Quad-channel charger with 4 independent circuits, which can charge four different kinds of batteries simultaneously. 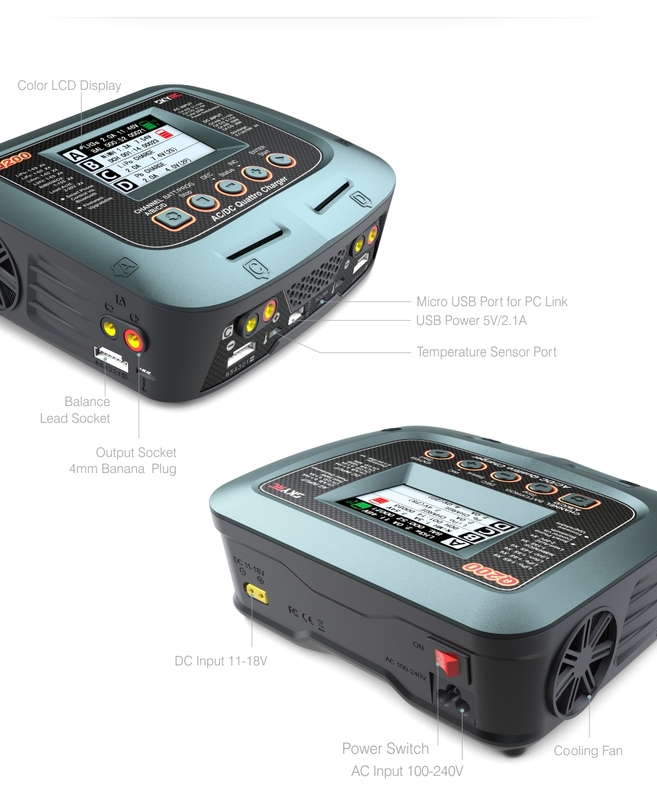 The charger adopts a 480x320 color LCD display, and paired channels (A&C or B&D) support power distribution in AC mode. Moreover, users could either connect it to PC or mobile device to further expand their using experience. Firmware upgrade is available via PC software interface. A very unique feature of Q200 is SCAN TO GO (automatic charging system). As the range of battery types and capacity becomes more and more, each battery requires its own dedicated charging process. It is easy to set up the charger incorrectly for a specific type of battery, resulting damage to the battery or even cause accident. The revolutionary SCAN TO GO provide a solution to this problem by allowing the user to assign a QR Code which contains all relevant data for the battery for charging/discharging. The user can create a unique QR Code by using the "SkyCharger" app. Simply print and paste the QR Code on the battery. Download the "SkyCharger" app on you smartphone and since all the essential information is stored in the QR code, all you need to do is press the Scan button, and the charging/discharging process will start automatically. During the manufacturing process, every Q200 production unit gets tested and calibrated after highest factory standards. Ambitious users who trust their own expensive equipment more or who prefer their personal fluke to serve as reference have the possiblity to adjust the Q200 factory calibration by a few counts. Lithium Battery Balancer - SkyRC Q200 employs an individual-cell-voltage balancer. It isn't necessary to connect an external balancer for balance charging. Program Data Store/Load - The charger can store up to 10 different charge/discharge profiles in each channel, few clicks can activate them, which saves you repeating the dull settings. Battery Meter - The charger can read individual cell voltage and total voltage of the battery pack. Battery Resistance Meter - The charger can test individual cell's internal resistance and the total internal resistance of the battery pack. PC Control - The PC software enriches operating experience, like viewing real-time graphs of voltage, amperage, capacity and temperature. The Bluetooth 4.0 connectivity allows the user to remotely control and monitor the Q200 comfortably through an app on a portable device such as smartphone, iPad, or iPhone. The iOS app can be downloaded from iTunes Store, the Android app from Google Play Store. Operation of the app is self-explanatory and the same on iOS and on Android. Explicit pairing is not required; after download and installation just activate Bluetooth on your mobile device and launch the app. Q200 and your device will establish Bluetooth connection automatically.